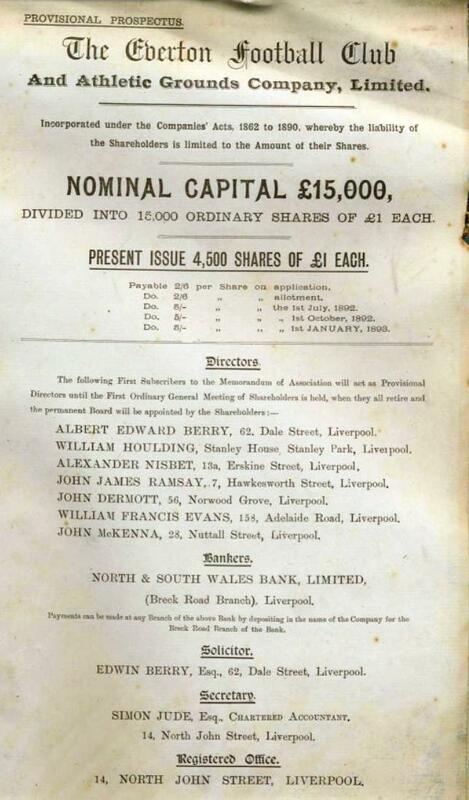 A new perspective on the birth of Liverpool FC - LFChistory - Stats galore for Liverpool FC! This is the first chapter in Liverpool FC's history where we bring forth a new perspective on the split between Mr. John Houlding and Everton FC, which will explain better the birth of Liverpool Football Club. Meeting 12th of October 1891 in the lecture hall of the College at Shaw street. 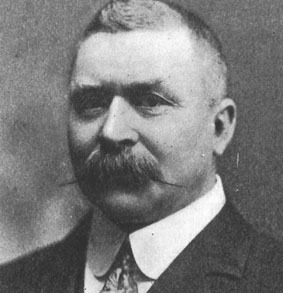 The chairman of Everton FC's meeting read a letter from Houlding: "Mr John Orrell has given me notice that he intends to exercise his right to make the road on the north side of the football field, one half, namely, 18 feet of the breadth, of which must be constructed out of my land, and one half out of his. The enclosure and stands, which have been erected, on sufferance, by private subscription, extend over the 18 feet contributed by me, and I am required by Mr. Orrell to remove them forthwith. Under these circumstances, it is with extreme regret that I am obliged to give you notice, which I hereby do, that you must give up possession of the piece of land, situated between Anfield-road and Walton Breck-road, used as a football ground, with the approaches thereto, after the closing of the present season, namely on the 30th of April, 1892." Everton's committee had already talked to Orrell and Houlding on this matter. Orrell, who was first interviewed, said that he was prepared to abandon his plans if the club would pay him £100 for the rent of his land for the present season and on payment of £120 a year in advance, Everton would get use of his ground for ten years, which the club could use for training purposes. Houlding was then interviewed on 21st of September and he said that as long as the club would continue to pay him rent of £250 per year he was happy for them to keep playing on his ground. Mr. George Mahon and his followers thought it was unacceptable for Everton to pay a total of £370 a year to keep on playing at Anfield and have a training ground on Orrell's land. Mahon announced he had got a reasonable offer of a more suitable piece of land, Mere Green, at Goodison-road for £50 rent per year. 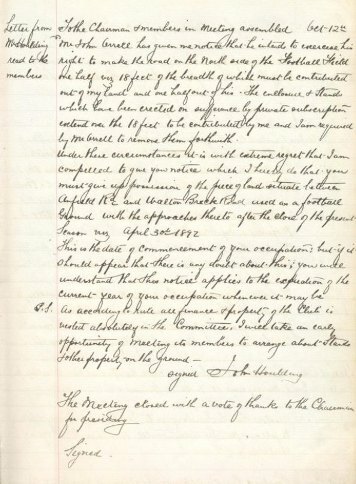 He further instructed that "a special committee be appointed to inquire into the whole matter of the ground, the terms on which the present ground [Houlding's] and the adjoining field [Orrell's] can be rented or purchased, and also the terms on which new grounds [Goodison-road] can be obtained." Mahon was a senior partner in accountant firm: Roose, Mahon & Howard and the organist at St Domingo's church. Mahon along with Reverand B.S. Chambers formed a football team in 1878 for the church's cricket team to be active during the winter months. The team that started life as St. Domingo's became Everton in 1879. Meeting 15th of October 1891. Everton had been paying £250 a year for Houlding's Anfield for three and a half years, but they were now forced by circumstances to pay an extra £120 a year to Orrell for the rent of his adjoining ground. 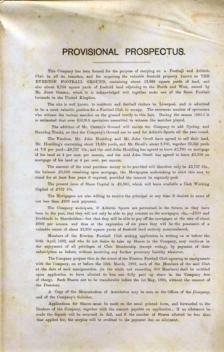 A proposal was put forth by Houlding to form the Everton Club into a limited liability company in order to raise capital to purchase his Anfield ground and Orrell's land. Mr. Clayton held a long speech opposing the idea and "evident from the reception he received at the end of his remarks that he had the sympathy of the meeting." At the end of the meeting this scheme was rejected. Meeting 25th of January 1892 in the College, Shaw street. Clayton said that he was opposed to buying Houlding's ground as he felt it was overpriced. Clayton had consulted a land agent who said that the land was only worth 4s. 6d. per yard, not 7s. 6d. which he claimed was "ridiculous". This would mean they would have to raise £10,000-12,000 considering the relatively small capital they could raise hence a big mortgage. 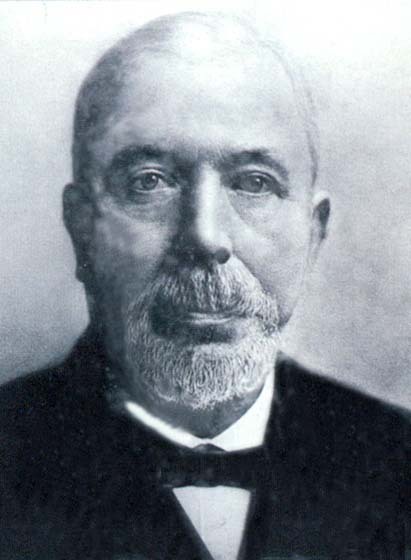 Houlding had already explained in detail his outlay in the purchase of the land and the interest he had received from year to year. £250 a year was a fair amount since he had paid £5,400 for the ground (Houlding acknowledged at the general meeting two months later that he paid £5,228 for Anfield) and plus legal costs he felt he was entitled 4% interest. Houlding said that his total outlay at the time had been £6,000. Reportedly he had been paying 3% interest on the £4,000 mortgage he took to purchase the ground. Clayton argued that if they would take into account the amount paid by Houlding for Anfield which was £5,400, 4% of that would only amount to to £216. Furthermore that had been paid for the actual playing ground and the frontage of the ground which was "a vacant land used for the purpose of persons going to and from the entrance gates", as Houlding himself described it. Clayton felt it was unfair to pay 4% interest on the frontage that Everton did not use. (This remark was followed by big applause). If they took the value of the frontage at 7s. 6d. it would be worth £900. If they would pay 4% interest as suggested by Houlding on the £4,500 he paid for the playing ground as such, that would mean a rent of £180 per year. 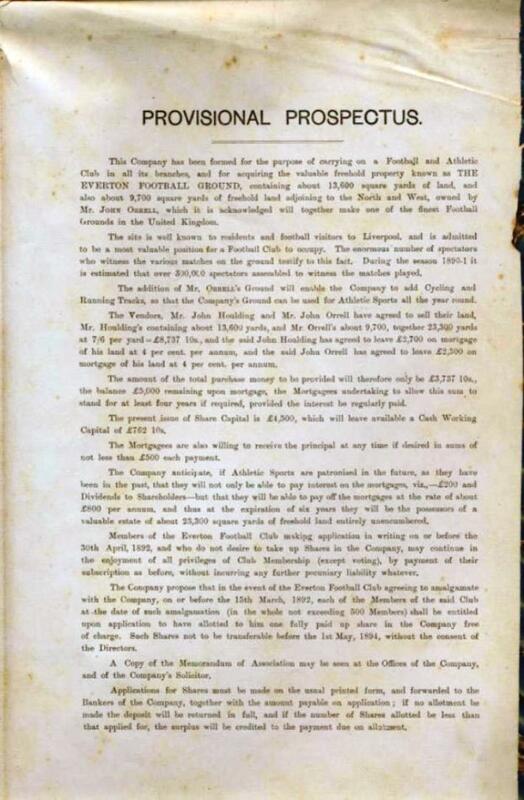 Consequently Clayton proposed: "That we offer Mr. Houlding £180 per annum for the ground used by Everton Football Club on lease for 10 years; rent to be paid quarterly in advance. The tenants to have the option of purchase of the land @ 7/6 per yard, such purchase to be arranged between now and April 30th, 94." Mr. John McKenna who spoke on Houlding's behalf at the meeting was not well pleased and reiterated that they had heard time after time that Houlding would not accept £180 and not alter his conditions one iota. McKenna also stated that he felt personal animosity towards Houlding was behind this proposition (which met with cries of "No, no" and "Withdraw" from the meeting). Clayton called McKenna an "irresponsible official". Mahon put forth a proposition that Everton should rent the Goodison-road site for £50 a year as Houlding was not going to compromise. That was agreed by a large majority, but Houlding was given seven days to lower the rent from £250 to £180. 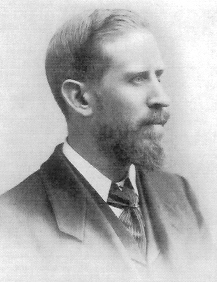 Clayton proposed a limited liability company should be formed, to prevent any future loss having too much effect on each of Everton's members. Everton's vice-chairman Mr. W.E. Barclay, who had chaired the meeting, was very unhappy with the result and tended his resignation four days later. As had been decided Everton FC's committee sent a registration for its own limited liability company with a capital of £500. However, the club's registration was temporarily rejected as Houlding had registered his own company in Somerset House with a very similar name to Everton Football Club: "The Everton Football Club and Athletic Grounds Company, Limited" just 24 hours previously, the day after the meeting at the College, on 26th of January. Two companies could not share the Everton name. The gloves were now officially off! 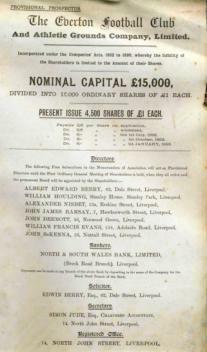 Houlding stated in the prospectus that "This company had been formed for the purpose of carrying on a Football and Athletic club in all its branches, and for acquiring the valuable freehold property known as the EVERTON FOOTBALL GROUND, containing about 13,600 square yards of land, and also about 9,700 square yards of freehold land adjoining to the North and West, owned by Mr. John Orrell, which it is acknowledged will together make one of the finest Football Grounds in the United Kingdom. The addition of Mr. Orrell's ground will enable the company to add cycling and running tracks, as that the Company's ground can be used for Athletics Sports all year round. 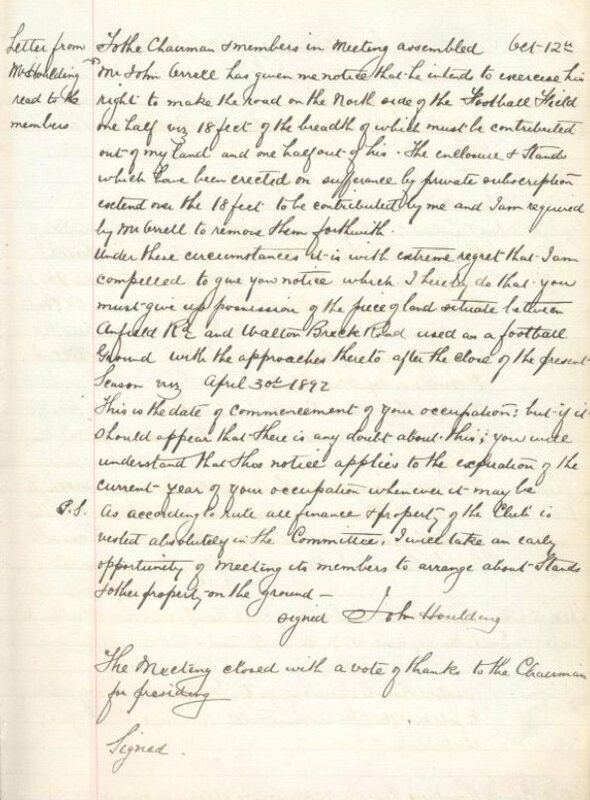 The vendors, Mr. John Houlding and Mr. John Orrell have agreed to sell their land, Mr. Houlding's containing about 13,600 yards, and Mr. Orrell's about 9,700, together 23,300 yards at 7/6 per yard - £8,737 10s."